This article first appeared in the March, 2006, issue of 2e: Twice-Exceptional Newsletter. Why does your child or your student struggle with the writing process in school or refuse to write? How might you help that child enjoy writing more or at least get it done in a timely manner? I wrestled with these questions for 10 years as a teacher in a private school for gifted and talented children. In searching for answers, I came to appreciate the incredible importance of respecting and meeting the individual needs of all learners. Once I realized that the learning differences of each of my students were the keys to both their uniqueness and future success, I became more effective in helping them develop as writers. This shift in my own thinking, however, did not happen overnight. It took time to discover what might work with my students. Eventually, it was my curiosity and enthusiasm for new technology that transformed my thinking and my approach to teaching writing. Fortunately for my students, I was able to tap into the power of handheld technology to help them. Thanks to the availability of this technology in my classroom, students who were reluctant and unsure as writers became more confident and secure as learners in general. When six desktop computers were installed in my classroom, I began to see the difference that technology could make for beginning writers. I saw that many of my third-graders needed a catalyst of some kind  like a desktop computer  to help them get their ideas out more clearly and effectively than they could with paper and pencil. While these computers helped many of my students, they werent the complete answer for all writers. For example, there was Zach, a 2e learner who had great difficulty with manuscript and cursive letter formation. He was clearly more comfortable and successful writing with the AlphaSmart 2000, a small, portable word processing device that his reading tutor recommended. 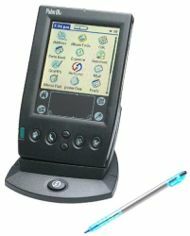 Palm IIIc: a handheld computer, often referred to as a PDA. Other common names for these devices are handhelds or palmtops. They have a relatively large touch-sensitive color liquid crystal display. Users can enter data using either a pointing device called a stylus or an optional portable keyboard which unfolds to the size of a full-sized keyboard. In fact, since my school had the same AlphaSmarts available for student use, I began to offer other students in my class a choice of writing tools. They could use an AlphaSmart, a desktop computer, or stick with pencil and paper. The flexibility and portability of the AlphaSmarts were especially appealing because they allowed students to work anywhere in the room. Soon my students had another electronic option in the classroom. It became available as the result of a grant proposal that I wrote with a collaborative team. Our school received 40 Palm IIIc handheld computers to use in our two third-grade classrooms. The grant proposal focused on using handhelds to help us differentiate the math curriculum. Teachers used the handhelds as a tool for assessing students. Students used the devices in several ways: to complete a pre- and post-test self-assessment of their understanding of unit goals, to keep track each day of their homework assignments, and to record their feelings about the use of the Palms and about math in general. It was obvious that the Palms definitely motivated our students and engaged them in learning. Seeing how excited the students were, I expanded our use of the Palms the next year and began to see how effective the handhelds were in differentiating the writing curriculum. I got six portable keyboards for the Palm IIIcs and then offered my students an even wider choice of writing tools. Having this additional choice made an incredible difference in how some of my students approached writing. Resistance began to fade, and more students began to feel empowered as writers. 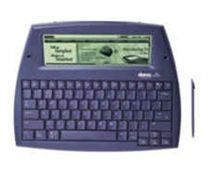 AlphaSmart Dana: One of several models of extremely durable, lightweight electronic writing tools, about the size of a three-ring binder. The Dana has a bigger screen than other AlphaSmart models (roughly 7 inches by 2 1/2 inches), a stylus, and a full-sized keyboard. In addition, the Dana has all of the functions of a PDA. All AlphaSmarts come with a word processor and a calculator that can handle equations. There are no commands to memorize. The device saves the users work automatically, and users can easily transfer it back and forth to a personal computer. Dyslexia often made it difficult for one of my 2e students, Adelaide, to finish her work on time when writing by hand. The desktop computer wasnt a solution for her because she found the finish her work on time when writing by hand. The desktop computer wasnt a solution for her because she found the desktop environment disorienting. The Palm, with its portable keyboard, however, was just what Adelaide needed. As her confidence grew, she expanded her use of the Palm and the keyboard to write poetry. Another student, Aidan, was a very reluctant writer until he started using the Palm with its tiny built-in keyboard. Then I witnessed an amazing transformation. Soon his words began to flow. He even organized a small group of writers who worked happily together, editing each others writing and beaming their stories back and forth using the wireless infrared port. While an administrative decision ended the use of the Palm IIIcs in my classroom after several years, both my students and I moved ahead to explore the AlphaSmart 2000s in greater depth. As I worked with one student, Kevin, I observed how the AlphaSmart enabled him to access the stories he created in his imagination. The kinesthetic properties of a smaller keyboard allowed Kevin to communicate the words he had inside his brain and heart  words that could not always be released with paper and pencil or a desktop computer. I witnessed how the use of technology, whether it was the AlphaSmart or the smaller Palm IIIcs, leveled the playing field and granted students like Kevin access to our curriculum and the world of writing. My classroom experiences soon led me to investigate a newer model of AlphaSmart, the Dana. This rugged laptop alternative combines a larger screen with the Palm operating system and its built-in applications. My interest in the Dana coincided with the request from the parents of Christopher, a 2e middle schooler, to have their son use a Dana in the classroom. Fortunately, I was able to be a Dana resource and offer support to Christopher and his teachers in meeting his writing and organizational needs. At the same time, another student with juvenile arthritis, Garrett, began to use the AlphaSmart 2000 in his fourth-grade classroom. His occupational therapist recommended the electronic keyboard as a way of protecting Garretts joints from the pain and fatigue he experienced when holding a pencil for a long period of time. Garrett met with increased success in the classroom because his teacher was insightful, flexible, and respectful enough to allow him to use the AlphaSmart as an equal option to paper and pencil. All these experiences with so many different students taught me that there is much we can do to assist our young writers. By honoring our childrens learning preferences, we can offer them the writing options that will help them succeed. In allowing students to choose handheld technology as a tool, we will truly respect and meet their needs as learners and empower them as writers. Training for teachers is available from Palm, Inc., or from AlphaSmart, Inc. Both companies will set up teacher training in local schools. Other sources of training are private companies, consultants, and coaches as well as workshops conducted at technology conferences, colleges, and universities. Since I began using these two different handheld tools  Palms and AlphaSmarts  in my classroom, I discovered many other uses for them beyond those of the original Palm grant focus. For example, they both have the capacity to help students keep work organized since all documents are automatically saved. I also observed that handhelds can truly motivate students to take responsibility for completing their work and keeping track of their assignments. For me, as well, using a Palm helped my own organization at school and at home  so much so that I bought one of the newest models. With the Dana and its Palm OS, students gain access to thousands of software applications, freeware and for purchase, that have been developed for this operating system. Two of these applications, Inspiration® and Thought-Manager, have tremendous potential to help any student easily organize his thoughts through the creation of concept maps and outlining of notes. One of my former students, Carl, met with growing organizational success in middle school by just utilizing the built-in features of the Dana. He could keep track of his schedule and assignments by using the Calendar, the Memo and the To-Do List to list and check off his completed work. Each of the available AlphaWord files on the Dana was assigned to a different subject so that he could easily locate all of his work; and to help him remember which file was assigned to which subject, a label was placed on the back of the Dana. Using the Danas USB cable, Carl could transfer his files from the Dana to the desktop computer to further edit his work. He could also access an infrared-ready printer and beam (transmit) his document directly from the Dana to the printer and hand it in after printing. Cathy Risberg, M.A., is an educational consultant. As the owner of Minds That Soar, LLC, she specializes in providing academic advocacy services for gifted and twice-exceptional children and their families. Cathy has 15 years of teaching experience in public and private schools, the last ten as a classroom teacher in a school for gifted and talented. She is an adjunct faculty member for the Technology in Education program at National-Louis University in Evanston, Illinois, and presents regularly to various educational and professional groups. Cathy can be contacted at c.risberg@comcast.net.